1965, William Maloney. Recast by Chris Barela. Text from commemorative plaque: "Tim Kelly Lifeguard memorial is dedicated to the brave men and women who have passed through the ranks of the Los Angeles County Fire Department's Lifeguard Division. Their courage, professionalism, and devotion to lifesaving is recognized worldwide. 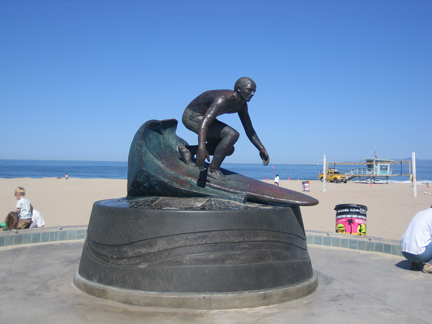 This memorial also recognizes the unique contribution the City of Hermosa Beach made to professional lifesaving from the days of lifeguard peioneer George Freeth, to the present. Original William Maloney figure was recast in bronze by artist Christ Barela. Tim Kelly Lifeguard Memorial Committee: Peter Tucker, Captain Mike Cunningham, Paul Gudmundsson, Alex Bannerman, Susan Blaco, 2005." The 1965 statue was made of plaster. Its plaque stated: "This statue is dedicated to the memory of Tim Kelly (1940-1964) L. A. County Lifeguard, noted surfer, youth worker Tim Kelly is also honored by dedication of the beach at the north side of the Redondo Beach breakwater (south from here) and the tennis courts at Clark Stadium, Hermosa Beach."